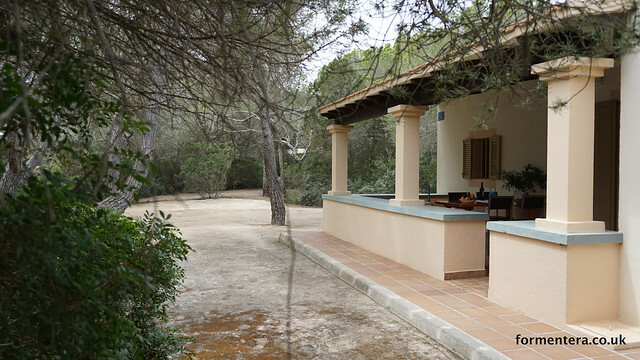 These lovely villas are set amongst the small pine wood of Es Calo, with their terraces leading onto a private garden area partly shaded from the summer sun by pine trees. Village and harbour close by. Small, sandy bays set on a rocky coast can be reached in a couple of minutes through the pine grove. The beach of Es Calo within a 5 minute walk. Two, 2 bedroom villas, sleep up to 6. Living / dining room with twin sofa beds and kitchen area with breakfast bar. New modern bathroom with shower. New flooring throughout the villa. Two bedroom villas have twin or double bed configuration and ceiling fans. Terrace with table, chairs and sun beds. For families with children - use the total number of people, and reduce price by the nightly child discount rate.